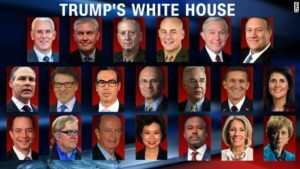 While some pundits see a clash of egos ensuing in President-elect Donald Trump’s Cabinet, optimists believe the new administration will be, as designed, a coming together of a determined team of titans. “Surrounding yourself with military guys and money guys sends a certain message,” Zelizer said. “A certain kind of cutthroat aggressive dealmaker” is how Trump sees himself. President Barack Obama filled his Cabinet with experienced D.C. technocrats in 2008, including Hillary Clinton as his secretary of state. Robert Gates, who served the previous administration, remained at the Pentagon, and Obama made longtime Justice Department official Eric Holder attorney general. “Trump’s roster of agency heads and advisers conspicuously lacks intellectuals, lawyers, and academics of the sort sought by some past presidents. In their place are titans of business and finance from the likes of Exxon Mobil and Goldman Sachs and no fewer than three retired generals in key positions,” James Oliphant and Emily Stephenson wrote for Reuters on Dec. 17. Those with a high level of familiarity with Trump’s picks believe they will more than rise to the challenge. Rep. Tom Price, Georgia Republican and Trump’s choice to lead the Department of Health and Human Services, is “decisive by nature,” said fellow Republican lawmaker Tom Cole. He credited Price’s career as a surgeon, which is also the former profession of Ben Carson, Trump’s choice for secretary of housing and urban development. The Reuters report noted that “several of Trump’s picks have never held any sort of government post and have little, if any, background in policy-making,” including (secretary of state nominee Rex) Tillerson, Treasury nominee Steven Mnuchin, a Goldman Sachs alumnus, Commerce pick Wilbur Ross, a billionaire investor, and Gary Cohn, the Goldman Sachs executive who would chair Trump’s economic council. “The incoming Trump administration is poised to undo as much of President Barack Obama’s accomplishments as possible, while also attempting to advance a conservative policy agenda in areas such as taxes and healthcare,” Oliphant and Stephenson wrote.